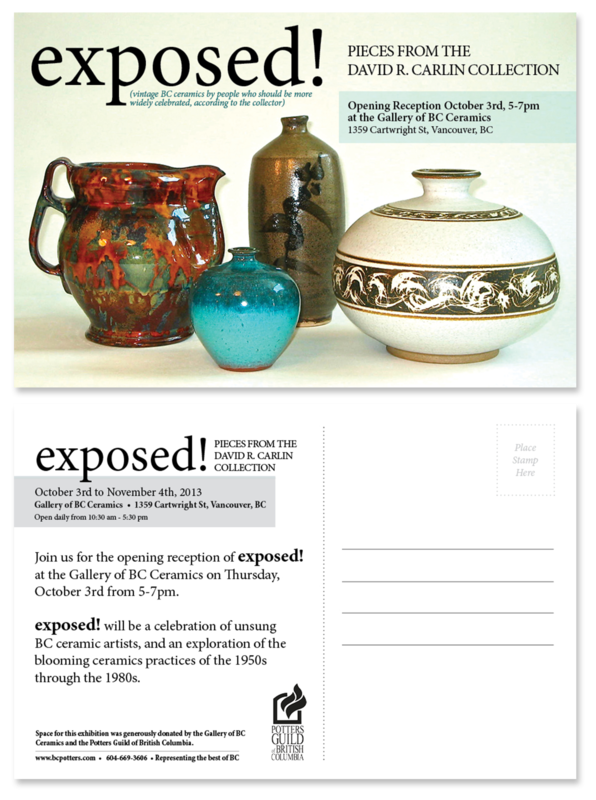 The David R. Carlin Collection recently had a show at the Gallery of BC Ceramics on Granville Island, highlighting the vintage works of little-known BC ceramics artists. When I was contacted to do the invitation design it was a huge honor and a fun chance to work on a new project. I’ve done a lot of flyers where the important thing is to organize as much information as possible into a small space in a way that will communicate the pertinent details best. The invitation for this show was a post-card, something I’ve been itching to do, and it gave me the opportunity to work with space. It needed to be clean and elegant – professional yet inviting – and reflect the slightly cheeky sincerity of the show. This gave me a chance to play with the clean aesthetics that I aspire to, and promoting artistic ventures has always been very near and dear to my heart, so, all in all, it was a very satisfying piece to do.